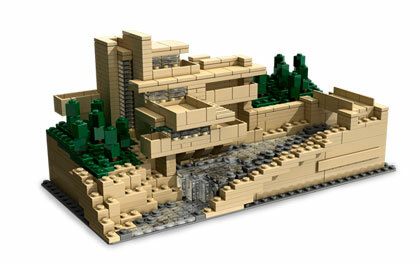 LEGO® model of Frank Lloyd Wright's Fallingwater (1934), co-developed and designed by architect Adam Reed Tucker. Available online from the Milwaukee Art Museum Store. Tomorrow’s “MAM After Dark: Mr. Wright” will celebrate Frank Lloyd Wright: Organic Architecture for the 21st Century. There will be great music, tours of the exhibition, and a twenty by twenty foot Lego pit, hosted by the American Institute of Architects (AIA). I can’t contain my excitement! I’ll be in there in the Lego pit, building Frank Lloyd Wright inspired buildings, happily looking up like a two-year-old at the larger-than-life Robert Therrien table and chairs in Windhover Hall. In my Lego-mania, I discovered online that I’m not alone. Notably, in the fall of 2005 the Liverpool Museum’s Walker Art Gallery had an exhibition by The Little Artists (John Cake and Darren Neave) who built their own miniature exhibition of modern and contemporary art made out of Lego bricks. Here is another site that show a wide array of art-related Lego creations. And here I learned that the Lego company takes architecture very seriously! How fun. This entry was posted in Art, Events and tagged architecture, Exhibitions, Frank Lloyd Wright, Lego, MAM After Dark. Bookmark the permalink. I build things with legos are there any jobs in this field?